View of the back of Hampton Court Palace showing the facade of the seventeenth century Royal State Apartments, built for William III and Mary II by Christopher Wren. Hampton was originally chosen as the site of Cardinal Wolsey’s grand palace because it was close to London yet it was free from the pollution of the city and residents could benefit from the clean air and water. During Henry VIII’s reign the palace was a favourite Royal residence. 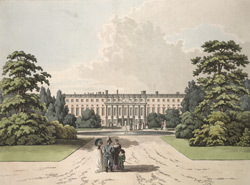 The palace had attractive formal gardens, parts of which can be seen here, as well as many acres of parkland.